Now that the craziness of the Thanksgiving holiday is behind us let's take some time to focus on cooking Middle Eastern food! At least that's what my Progressive Eats friends and I are doing. What is Progressive Eats? Well it's a virtual version of a progressive dinner. A different topic is chosen each month and members share theme specific recipes on their sites for you to enjoy. Our event is being hosted this month by Susan, who blogs at The Wimpy Vegetarian. We have a full menu of ideas to tempt you into the kitchen and release your inner-Ottolenghi. If you’re looking for something new to try, check out these wonderfully creative dishes! I've decided to bring the Hummus, not just any old hummus! This recipe is closely modeled after Chef Michael Solomonov famous Zahav restaurant version. What makes it so special? Some say it's soaking the chickpeas in baking soda, others swear it's using unpeeled heads of garlic. But I think it might be the Soom Foods brand tahini. This has got to be the best hummus I've ever tried! Place the chickpeas in a large bowl with 1 teaspoon of the baking soda and cover with plenty of water. (The chickpeas will double in volume, so use more water than you think you need.) Soak the chickpeas overnight at room temperature. The next day, drain the chickpeas and rinse under cold water. Place the chickpeas in a large pot with the remaining 1 teaspoon baking soda and add cold water to cover by at least 4 inches. Bring the chickpeas to a boil over high heat, skimming off any scum that rises to the surface. Lower the heat to medium, cover the pot, and continue to simmer for about 1 hour, until the chickpeas are completely tender. Then simmer them a little more. (don't worry if they are mushy.) Drain. Meanwhile, process garlic with the skins on, lemon juice, and 1 teaspoon salt in a food processor until coarsely puréed. Strain garlic mixture through a fine-mesh sieve into a small bowl, pressing on solids to release as much liquid as possible. Return liquid to food processor; discard solids. Add tahini and pulse to combine. With motor running, add 1/4 cup ice water by the tablespoonful and process until mixture is very smooth, pale, and thick. Add chickpeas and cumin and puree for several minutes, until the hummus is smooth and creamy. Then purée it some more! Taste and adjust the seasoning with salt, lemon juice, and cumin if you like. 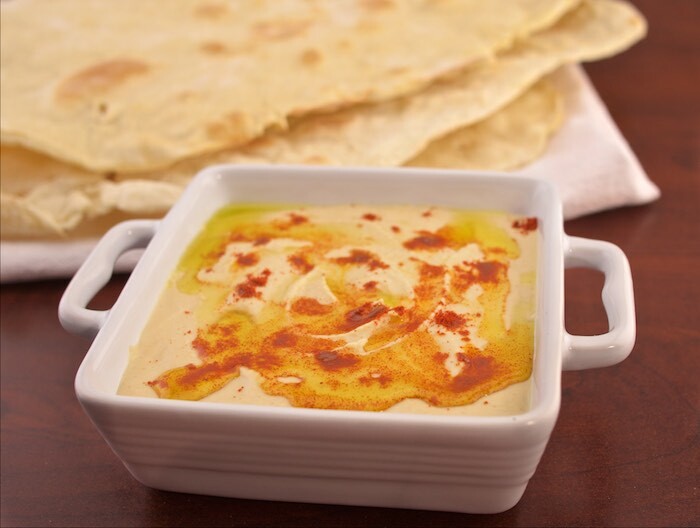 To serve, spread the hummus in a shallow bowl, dust with paprika, top generously with oil. My foodie girlfriend swears by Soom's tahini! I had in in my Amazon cart---need to put it back!! Great recipe!!! I haven't tried Soom's tahini and that has got to change, LOL. Hummus is the perfect way to start our Middle Eastern/Moroccan adventures Theresa! Oh, I do love a good tahini, and I will be taking your recommendation on Soom's! That whole clove of garlic with the skin on is intriguing, too--what a great recipe for one of my favorite snacks! I used to make my own hummus using Joan Nathan's recipe. But then I decided the result was no better than store-bought and I got lazy. I do have the Zahav cookbook and I noticed his recipe. I've been meaning to try it and now you're making me think the considerable effort might just be worth the time. Wonderful post. Love soom's tahini!! I am sure it is the secret to a great hummus ! !